Hello out there everyone and thank you so much for dropping by. Your visits and comments are always appreciated. Well it's been a busy one, visiting rellies, going to see Skyfall (amazing!!) and the ususal domestic chores we all love so much!! And then today I started a new job having taken a momentous leap of faith off a work 'cliff' over the summer. Sometimes you just have to trust that the right thing is going to happen, even if you are not totally sure what that 'thing' is!! A spot of crafting did take place too you'll be pleased to hear:) And hurrah! it fits with four challenges, so that helps the sense of achievement too!! And then The Funkie Junkie herself, Linda Coughlin posted her latest 12 Tags of Christmas Tag 8 which she also based on Tim's tag; even though I need to get 5, 6 and 7 done yet, it seemed sense to enter this one for the latest phase of the challenge and catch up with the others this week. 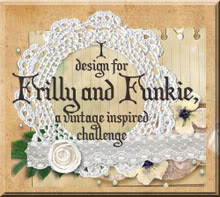 Just in case you haven't seen Linda's challenge yet, which is sponsored by The Funkie Junkie Boutique, there's still time to enter. 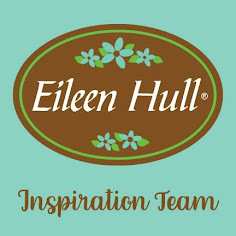 She provides a fab inspirational tag each week - pop over to her blog to find out more. Here's Linda's 8th tag so that you can see which elements I used too; resist, red, a Greetings sentiment and some of that fabulous jute. I love how the seam binding I got from The Funkie Junkie Boutique takes Distress Ink so well and allows it to blend. Team it with twine and string (from clothing labels:) and it looks really rustic. The background stamping over the initial colour layers is only really visible up close but adds so much underlying texture - this is where Tim's genius in putting tags together shines through. The gift of a seasonal bouquet fell in nicely with this rustic theme, especially with the jute, more twine and that lovely little tag; all this came from The Funkie Junkie Boutique again and as a result I will enter this into the Frilly and Funkie Sunday Share challenge too. Finally I mounted the tag onto a kraft card ready for sending next month (as I have done with previous tags). Over at Make My Monday the current challenge is to make an autumnal card with kraft and twine - now I know this is more about Christmas but the leaves, kraft and twine are there too, which fits the theme. Just sensational - love the deep rich colors and all the beautiful embellishments. 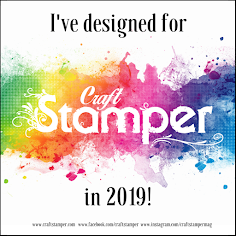 And thanks for letting me know I forgot to add the link to my #8 tag post! Hope you will go back and link up now. Congrats on the new job - that's always so exciting. And best of luck - hope it all works out the way you hope it will! Thanks again for playing along with the 12 Tags of Christmas Funkie Junkie Style! Tag is just fantastic - I'm wondering how on earth to avoid Christmas with this one - if I could surrender this brilliantly I'd go for it! The fir branch looks amazing bleached into the background with the fab technique; gorgeous trimmings; wonderful stamping. An all round triumph! Yeah Buttons if we don't sometimes jump from cliffs we can't keep our wings in shape :) Love the elemental colours and textures you achieved in your wonderful tag today. What an amazing tag.... so gorgeous!!!! Shhhh..don't tell anyone, but I do believe your tag is my most favorite of all the takes on Tim's Tag! ;-) Really, really absolutely gorgeous! Fabulous Buttons, the traditional Christmas colours, the fabulous techniques and your superb creativity have combined wonderfully to achieve such a work of art. I love it. I hope you have enjoyed your first day in your new job and good luck with it. Well I thought I did really well to get my No8 made and linked up and I noticed you beat me to it!!!!! Amazing Tag, you have created the depth on your bg beautifully, it is rustic and I would say it would qualify for Autumn! Oooh its lovely - hope the job is going ok. This is a great tag and the elements go together really well - good that it covers several cghallenges as well. Good luck with your new beginnings - hope all goes well. Hi Buttons this is a fabulous Christmas tag in my favourite traditional Christmas colours. Lovely to se you joining us at MMM. I wish you much luck and happiness in your new job. Terrific Christmas artwork on this tag. Lovely work as always - the colours work beautifully and the berries are a great touch. Hope you're enjoying the new job- a change can be a bit scary at first! Those deep dark colours are utterly gorgeous! Your tag makes me feel like I am sitting peacefully in a room lit only by firelight, with the snow falling outside. And you did that as well as starting a new job! Hope you had a good first day. You've created a great tag - love the depth of colour and the festive foliage!! Good luck in the new job! Your tag is gorgeous Buttons. 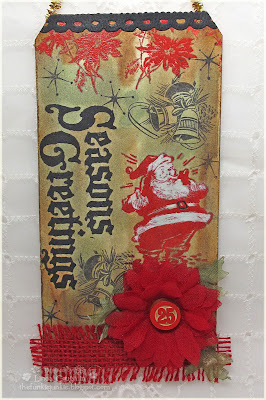 Love the inky background and your stamping and embellishing look beautiful. Glad you enjoyed the film as I did and I've got Adele constantly singing in my head at the moment! Hope your first day wasn't too stressful and that you're enjoying the new job. Buttons, a beautiful tag. Love the traditional theme and all of the added texture and fibre. Can't decide which of your tags I like the most. They're all so differently delightful. Thank you for your inspiring comments. Have a great week, cheers, Di. That's a fabulous tag with great details. Love all the elements. First of all...well done on the new job and holding out for the right one! I wish you WELL!!! Second, this is an uber fabulous take on Tim's tag...love the Christmas theme!!! Third, I love how you are mounting all the Linda tags on other cards...such a fabulous idea! One gorgeous tag my dear! This is a beautiful and creative tag! Bravo to you for jumping off that cliff and landing so successfully, maybe you will tell us all about your first week. Gorgeous rustic quality, it looks as though it should be for sale in a little boutique in rural America - love the details. Hope your new job is wonderful! These Christmas tags are so elegant and rich in color and design! Love what you did with Tim's and how fun is that Santa! Have a great evening! Beautiful tag! Love all of the dimension. Love all the contrast here in colors and texture... just beautiful! That cluster of leaves and bits down below is so interesting. Love it! Fabulous tag, and such great texture, love the cluster of leaves. Sorry for the late comment, but thanks for joining MMM. Stunning, LOVE your version of tag 8 and you have just inspired me to start on mine!!! Hope your cliff jump went well too!!! !